• Seating for 12 people in a formal setting. 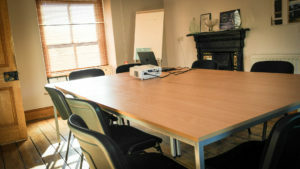 • Laptop, projector and screen with internet access. • Tea, coffee and biscuits included in room hire. • Buffet also available, on request. For more information, email GlesniMair.Jones@anturwaunfawr.cymru, or call 01286 650 721. We have a 24 hour cancellation policy. Full payment is required for any bookings cancelled within 24 hours of the scheduled room booking.